We all love scarves for keeping our necks warm during the cold winter months! I know I do! But there’s one thing even better than a scarf because it doesn’t fall off easily or become crooked with wear. That item is a “cowl”! If you’ve never heard of a cowl, it’s basically the same thing as an “infinity scarf”, which is a scarf that is joined together at the ends into one big, long tube. There are no ends to be concerned about being straight or even when wearing it. You just put the cowl over your head and wrap it around your neck once or twice, depending on your preference of length and neck warmth! And presto! You have a beautiful and functional accessory to proudly wear or give as a gift. And it’s one of those gifts that doesn’t have to be a certain size, too!!! Aren’t the colors pretty? I chose a ripple stitch pattern for this design because I like the way the changing colors are shown off to their best advantage. It’s also an easy pattern to memorize and crochet, as well as being quick to make! This cowl uses only 1 skein of the Unforgettable yarn, making it an economical project, too. There is only 1 seam to sew to join the bottom and top edges to form the tube-shaped cowl, as well as 2 tails to weave in (that’s not bad considering all the beautiful colors that change on their own!). I’m really going to enjoy wearing this cowl during the winter, which isn’t too far off now (we had our first frost on Sunday night, so winter is right around the corner here in the higher elevations of Arizona!). 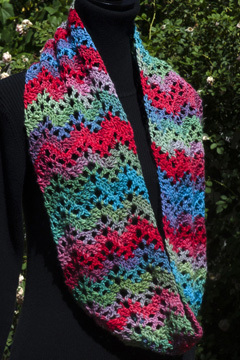 Have you started any new scarf or cowl patterns lately before winter hits where you live? Do you have someone on your Christmas list who loves scarves and cowls? 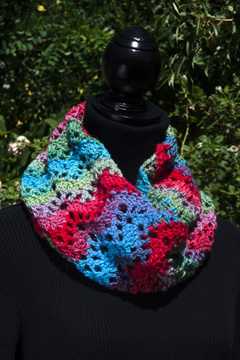 To purchase the “Unforgettable Ripple Cowl” pattern, just check out our “patterns” page! This entry was posted in Crochet patterns, Designing, Yarn review and tagged crochet, crochet patterns, Designing, patterns, published design, yarn. Bookmark the permalink.